So last night I was talking tech with a friend, and he doesn't have a smartphone (I know... whu??) and he was asking my opinion along with the opinion of another friend who has the iPhone. In the end we ended up showing this potential buyer that they both have similar features for what he wants (I want a large contact list, be able to send text messages and navigate to places). 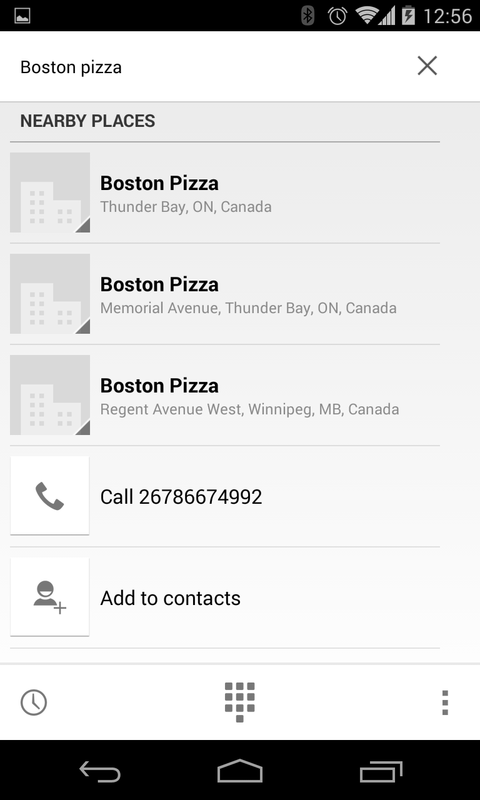 One thing I did get to show him was the new dialer feature in KitKat... where you can just search for not only contacts but nearby businesses. He liked that. Then I realized that that feature wasn't allowed in the Note 3 I also had on me at the time. Just like the iPhone user kept showing that they each had similar features, but it requires another app, or another app, etc... Well, it looks like that this dialer feature can be added to non-Kitkat Nexus devices as well. Thanks to +Android Police they've been able to bring that APK to be able to sideload it to your device. Check out their article. NOTE: you will need to be rooted and be on 4.4 in order to have this. So venture forth at your own risk.